Coriant outlined its vision for bringing a high degree of programmability, automation and control to multilayer, multi-vendor transport networks. The Coriant Dynamic Optical Cloud will couple the company's metro-to-core packet optical networking capabilities with software-defined networking (SDN) intelligence. 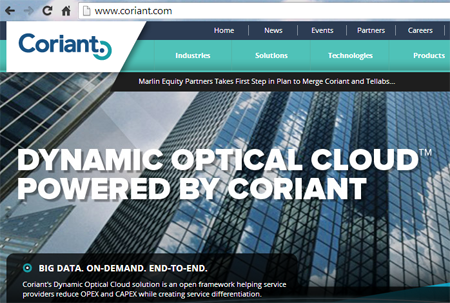 The Coriant Dynamic Optical Cloud includes the company's 7100 and hiT 7300 packet optical networking platforms, the 8600 mobile edge router, and a suite of applications, open orchestration and controllers. It also includes the new mTera Universal Transport platform. Coriant said it is working to integrated third party routers into these use cases as an initial step toward multivendor implementation. The company is currently engaged in multiple customer trials and will be trialing the commercial offering in the third quarter of 2014.